Traveling is just the excuse I use to try and eat at new places that I normally won't see back home in California. 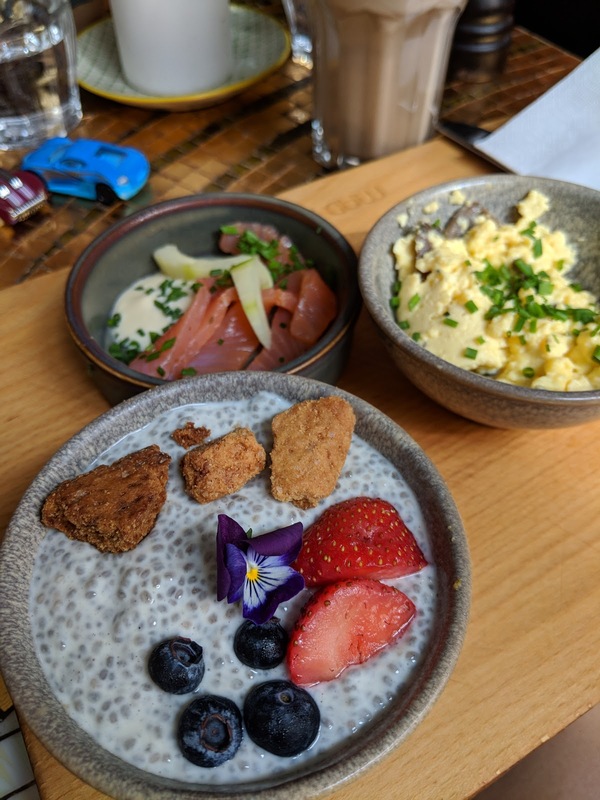 I came upon Mad + Kaffe, on one of my searches for a great breakfast and brunch place. They have three locations - Vesterbro, Amager and Frederiksberg. While our aparment is located in Frederiksberg, their Vesterbro location was a 10-minute walk away. Our walk from our apartment to breakfast introduced us to the local sights around town from street art on the sides of the buildings to saying hello to people as they went on their day. It also helped make the littles hungry for breakfast. 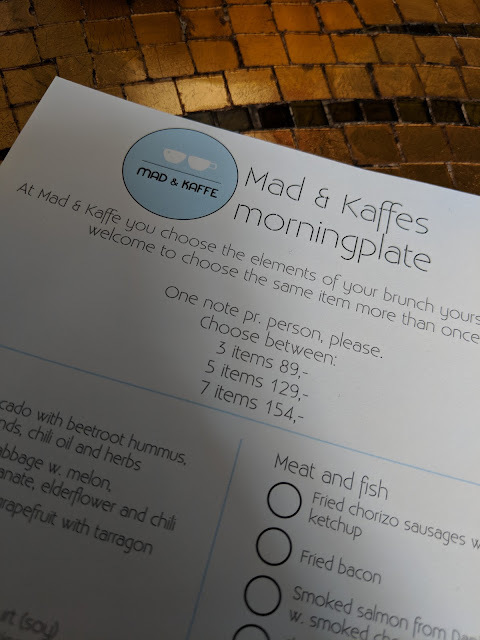 The Vesterbro location is the first Mad + Kaffe, which opened in 2015 and is on many of Copenhageners brunch bucket list. Granted aside from breakfast, Mad + Kaffe also offer lunch, where you can order burger, salads or sandwiches. As you can see below, to make your brunch order, you get to pick and choose the elements you want on your plate and you can chose from having 3 items to 7 items, with the prices ranging as well. All of us ordered 3 items each, with the littles ordering bacon and chicken nuggets and pastries. It's an interesting concept and makes it easy to share between each other as well. Order menu on choosing what will go on your breakfast plate. Mad + Kaffe are open daily from 8:30am until 8pm. Pro-tip - Prepare to spend time waiting around for table during their peak times, since they do not offer reservations for breakfast or lunch. We got there around 9:30am and were seated immediately inside. By the time we left, all the tables inside and outside were filled.